Well, I focused on the visual differences between subsequent versions. BTW: As I remember, the first few B-17s in UK were 20 B-17C, delivered to RAF in March 1941. They tried to use them as “stratospheric bombers” - a few of them bombed Wilhelmshaven from 30 000ft, then Brest. The effects of these attacks were close to nil. They operated much higher than the B-17s used by USAAF in the 1943 and 1944, and these early B-17C version caused many mechanical troubles. On of their basic reason were the extremely harsh conditions during the long flight on a very high altitude - this experience was later applied to the B-17E and F.
I assumed that all the key dimensions and bases are identical in both versions, just the details are different. 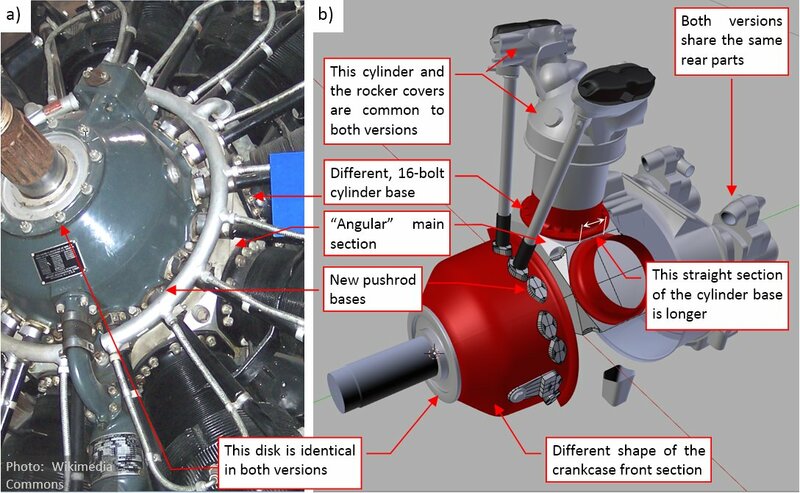 This assumption allowed me to determine the shape of the forged, “angular” main section of the G100 engine crankcase using just a few photos of its fragment (as in Figure “a”, above). (This element is quite obscured on all the photos that I had). The nine side faces of this section had to fit the corresponding cylinder bases. The adjacent, oblique faces between the cylinders had to fit the space between cylinder bases and the front / rear plane of this central crankcase section. However, while fitting the crankcase and the cylinders, I also had found that the 16-bolt cylinder base used in the R-1820-52 had a longer straight side segment (Figure “b”, above) than the 20-bolt base used in the R-1820-60. Because most of the cylinder parts were assigned to the E.100.Cylinder Base object (the “bare” cylinder), I decided to split it into the upper and lower part. The mesh of the upper part is assigned to this original E.100.Cylinder Base object, and used in both engine versions (Blender scenes). 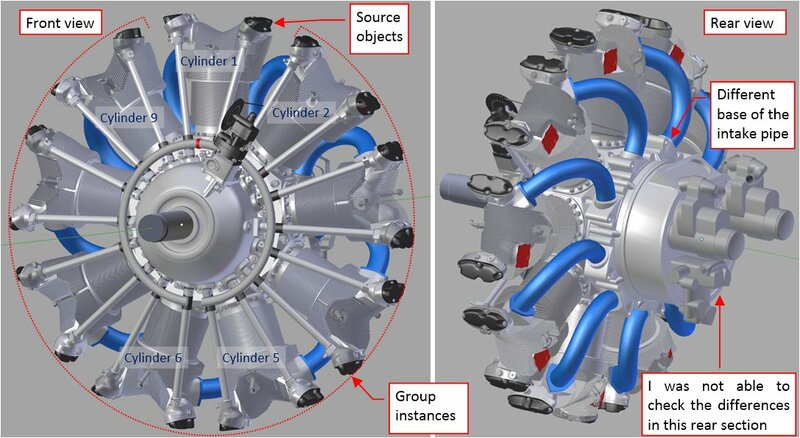 Each of these engines has its own lower part of the cylinder (marked in red in Figure “b”, above). The 20-bolt version is used in the “R-1820-60” scene and named G.100.Cylinder Base, while the 16-bolt version is used in the R-1820-52 scene and named F.100.Cylinder Base. To keep an order in this two-scene setup, I decided that the parts used in both versions (scenes) retained the “E” prefix in their names – for example “E.015.Disc”. The parts specific to the “-60” engine received the “G” prefix, while the parts of the “-52” engine received the “F” prefix. The crankcase front section in the R-1820-52 had smaller diameter than in the R-1820-60, and different side silhouette. Thus I had to model this fragment anew. I split it into 9 identical segments, as I did in the R-1820-60. 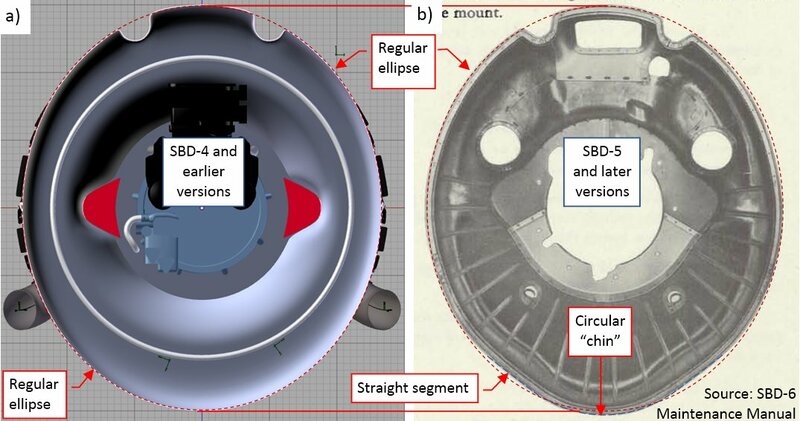 However, after some measurements, I decided that the disc that closes this crankcase from the front is identical in both versions (Figure “b”, above). To avoid eventual “orphaned” objects in my further work, I used this disc the root object in the “parent-child” hierarchy of both models. Compare the a and b distances in Figures “a” and “b”, above. 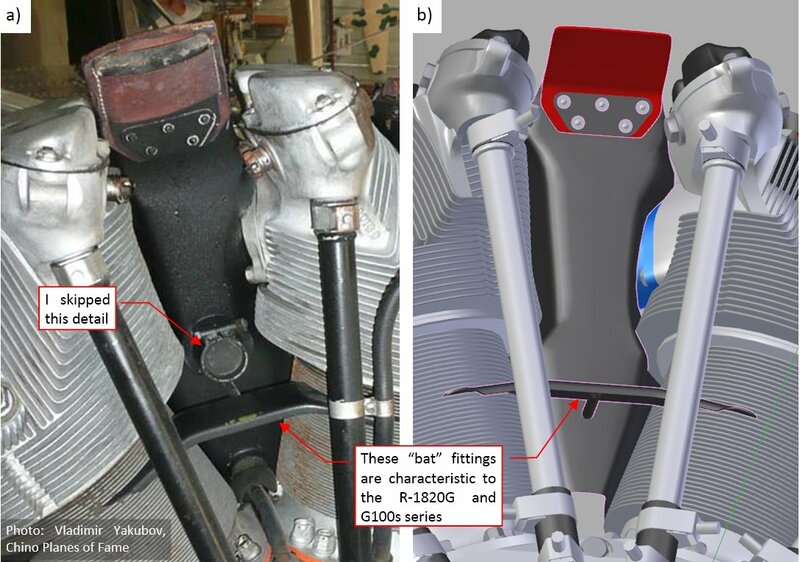 As you can see, there is wider space between the intake and exhaust valve pushrod (the b distance) in the earlier “Cyclone” G100 series (incudes the R-1820-52) than in the later G200 (includes the R-1820-60) series. The reverse proportion occurs between the pushrods of the adjacent cylinders (the a distance in Figure above). It seems that the pushrods in these earlier “Cyclones” were set along the radial directions, while in the later (G200) models they were set at a different angle. There is also another difference: Wright engineers reversed in the G200s the order of the pushrod cams. 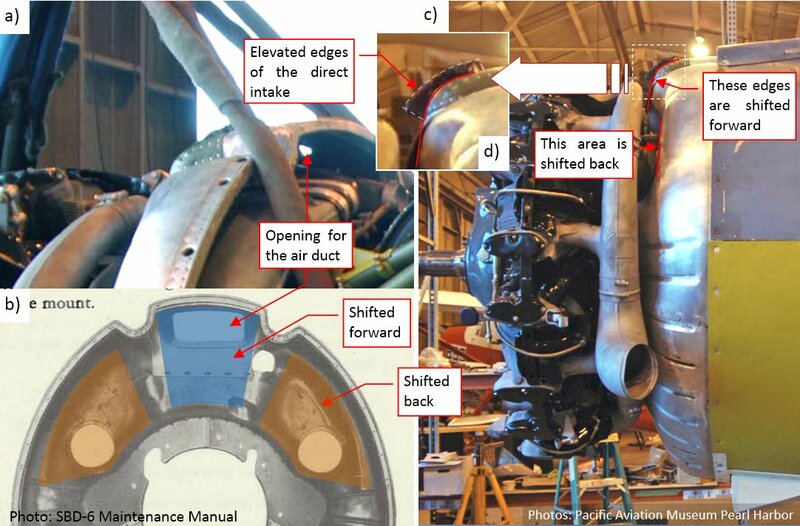 In the G100s and earlier engines the base of the intake valve pushrod was shifted forward (Figure “c”, above). 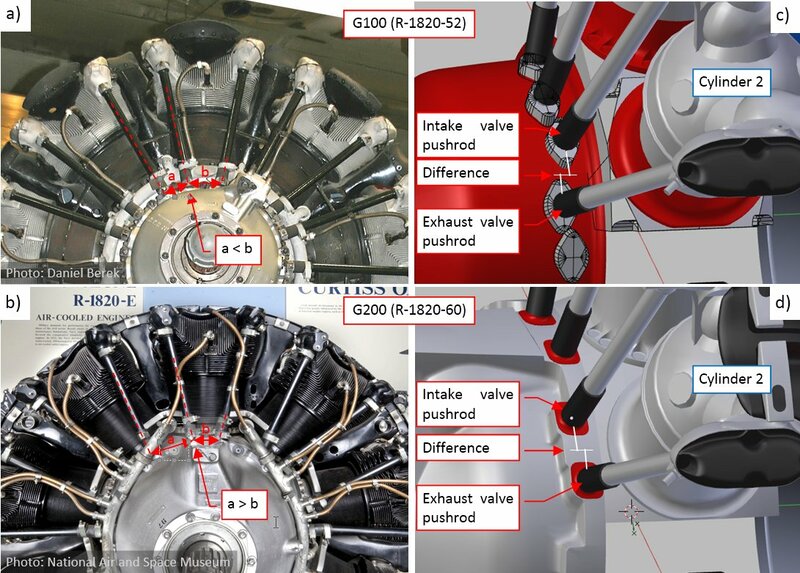 In the G200s they set the exhaust valve pushrod first (Figure “d”, above). This “block” version is built of several simple elements, like the pushrod bases, the rear, flat elements, and so on. Once their shape matched the reference pictures, I joined these elements into the single, more complex object using temporary Boolean (Union) modifiers. Finally I joined it with the basic front crankcase segment (Figure “b”, above). I also rounded the new intersection edges with a multi-segment Bevel (Weight) modifier. I applied here the same “approximation first” method, using intermediate simplified parts (Figure “b”, above). (As you probably observed, it became my usual approach to such complexities like this one). After the “fitting” phase I joined the bottom part of this “shelf” with the crankcase, and rounded the resulting edges (Figure “c”, above). On top of the “shelf” there was an additional, “stacked” part (I think that it was a kind of a cover). In the pictures above I marked it in red. In the final version I left it as a separate part, attached to the crankcase by the “parent” relation. In the background of figure above you can also see the first versions of the cylinder instances (I will modify them in the next steps), and the ignition harness manifold. (I preferred to fit it on this early stage of this the model, to avoid unwanted surprises later). I copied this governor from the R-1820-60 scene, then modified it a little (rotating the head with actuator wheel by 180⁰). Unlike in the R-1820-60, this object is set in the position parallel to the engine centerline. Looking from the front, it is mounted in an oblique position just to pass the control cable in the gap between Cylinder 1 and Cylinder 2. However, looking along this cable, I stumbled upon a new problem: it collided with the intake pipe! (Figure “b”, above). 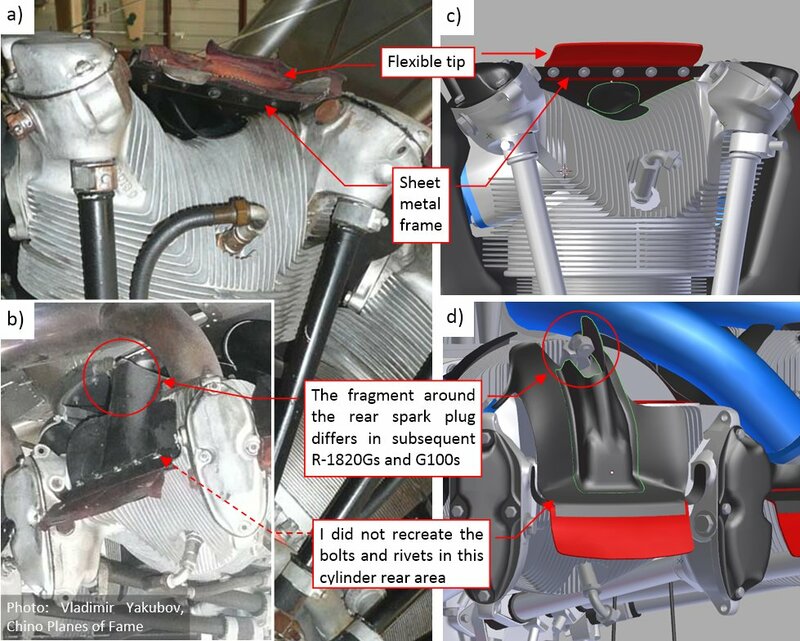 As you can see in the picture above, the intake pipes in the G100s models formed large arcs, leaving the gap between the Cylinder 1 and Cylinder 2 open for the control cable. This means that I have to modify these pipes in my R-1820-52 model. Thinking about the altered angle of the valve pushrods (see the second figure in this post) I checked the clearance between them and the cylinder head. In the R-1820-60 they were placed in deep troughs, “cut out” in the cylinder fins. I was surprised by the photos showing that in the R-1820-52 these pushrods would not collide with the cylinder head, even if this head did not have the minimal, shallow troughs. I studied this cylinder head closer: the spark plug hollows also seemed to be shallower, and the upper contour of the fins (as viewed from the front) was lower in its middle section. I started to compare proportions of these cylinders. Finally I decided that the fins in the heads of the R-1820G and R-1820G100 series were shorter than in the R-1820G200 (i.e. in my R-1820-60). I estimated that the G100s cylinder heads had 10% smaller diameter than the G200s heads. 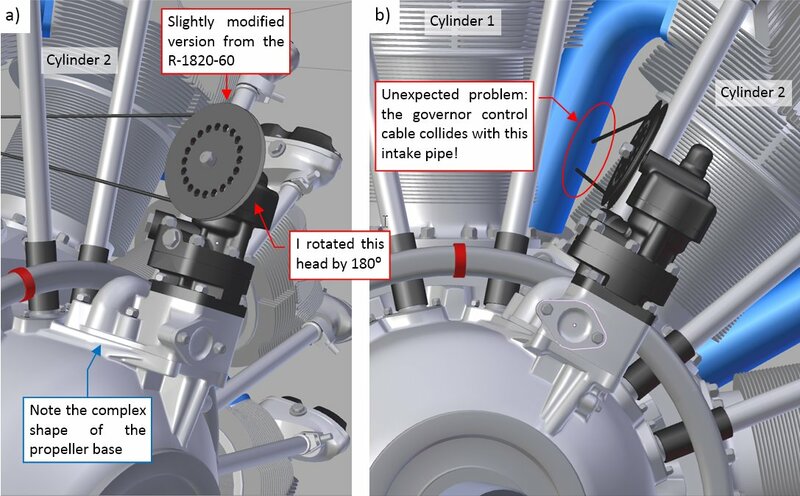 (It means that cooling area of the G200 cylinders was about 30% larger than the cylinders used in the G100s. It matches the differences in their power). Cylinders 2-9 are instances of the object group named F.G05.Cylinder. The source of this group are the components of the Cylinder 1. When I modify the source Cylinder 1, Blender immediately updates the remaining eight cylinders. Components of Cylinder 1 lie on two layers: 3 and 13, while the group instances belong to the single layer: 3. 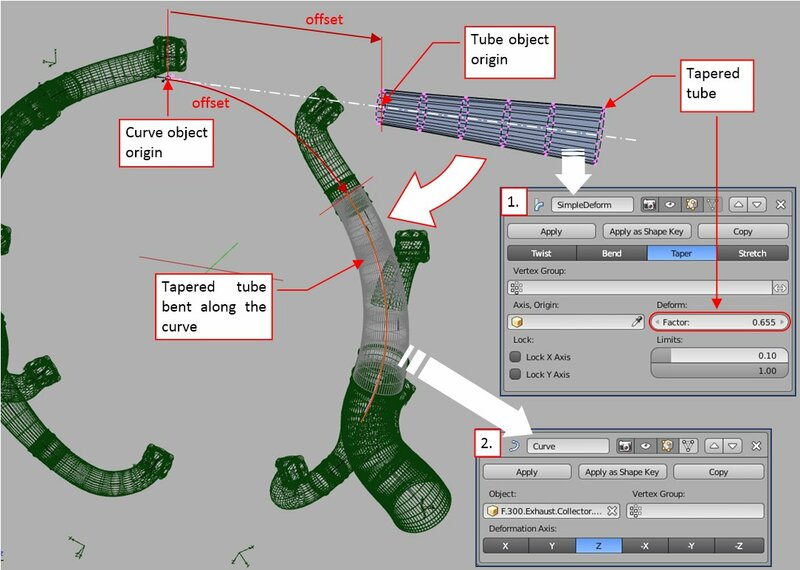 I have found such an arrangement most useful for the constant work on the cylinder details – I often did it on layer 13. Note that I also modified the bases of the intake pipes (I had a single, poor quality photo of this area). In general, it seems that the rear crankcase section of the G200s that I roughly recreated in the R-1820-60 is similar in the R-1820-52. The same applies to the magnetos and oil pump. This engine still lacks the cylinder deflectors, oil slump, and spark plug cables. In the next post I will finish all these details and fit it into the NACA cowling. 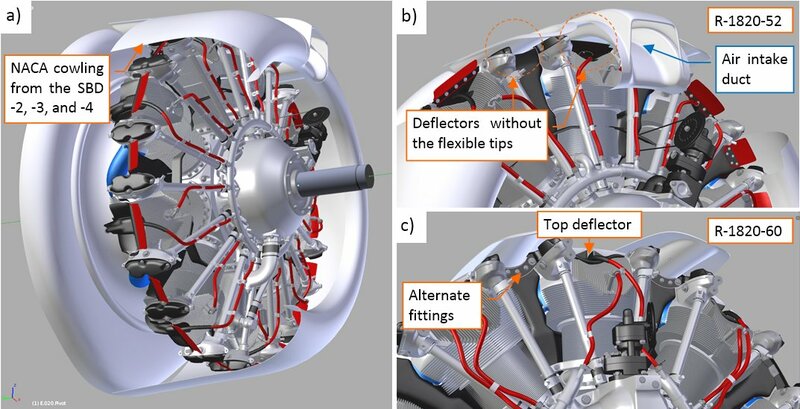 You can download the model presented in this post (as in figure above) from this source *.blend file. is there a post showing all the different file models ? but also what license is it ? at least give your name for modeller ! are these models going to be ported to 2.8 ? There is no “table of contents” of the published files. At the end of each post you can find the model (the link to the *.blend file). It contains the model in the state as described in this particular post. In some cases, when I discussed the textures, I also provided links to the GIMP/Inkscape source files. Frankly speaking, I did not want to patch all this law stuff into these intermediate stages of the model. (For example: I think that such a statement would look strange in a file that contains the wing alone). As I explained, you have to scroll the posts, to find the particular file you are looking for. For example, In this post you can find the latest state of my SBD Dauntless model. Because of the engine complexity I decided to make it in a separate Blender file, then append to the main model. 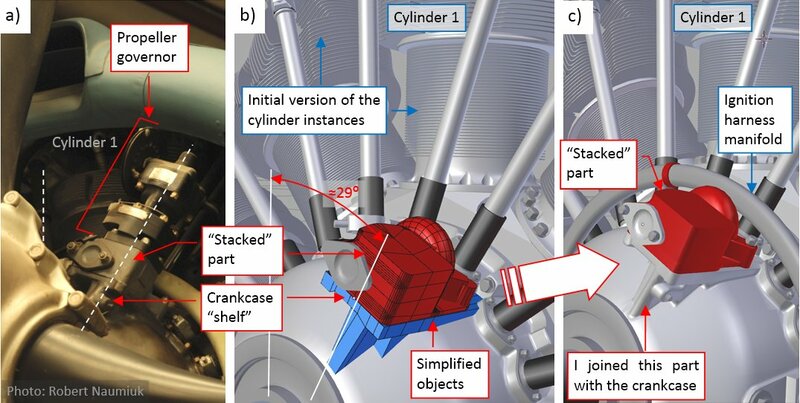 Because I used the group instances to recreate its cylinders and deflectors (examine the model enclosed to this post). Also note the relatively low number of vertices and faces. All the intermediate models that I have published so far, will remain in the current state (saved in Blender 2.7) - actually I see no reason to convert them. Eventually in the future, when Blender 2.8 reaches the productive version, I will switch to it, so the later models will be saved in this new version. However, at this moment nobody knows when it happens. 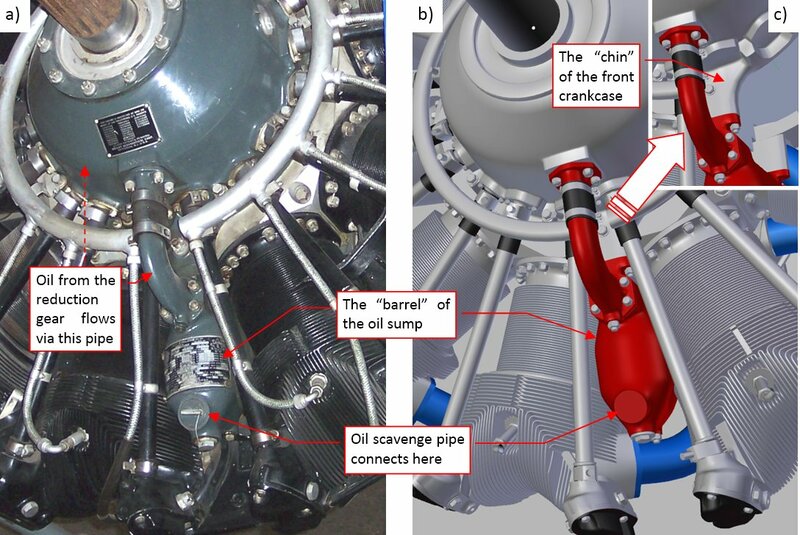 Oil sump shape vary even within the same G100 family: I observed different proportions of the front “barrel” and its forward pipe in the early and the later of these “Cyclone” models. 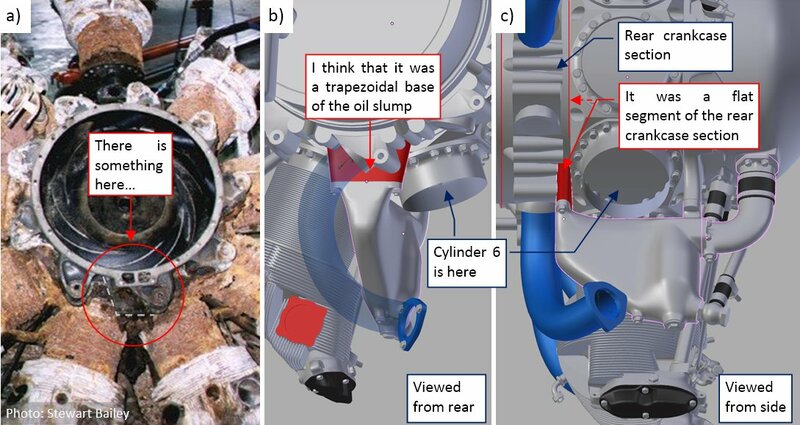 This particular oil sump (Figure “a”, above) was used in the later G100s engines, like the R-1820-52. Apart from the forward pipe, it was also attached to the front crankcase via a “chin” (Figure “c”, above). There is “something” at the bottom of this crankcase: it has a trapezoidal shape and (probably) two inner (oil?) ducts inside. I decided that this is the rear base of the oil sump (Figure “b”, above). It is quite thin (no more than 1 in), fitted between the crankcase main section (cylinder bases) and the intake pipe (Figure “c”, above). I recreated the sheet metal frame and the flexible (rubber?) tip (Figure “a”, “c”, above). The photos from the recovered SBD-1 show, that there were some variations in the shape of the deflector rear part, around the spark plug. 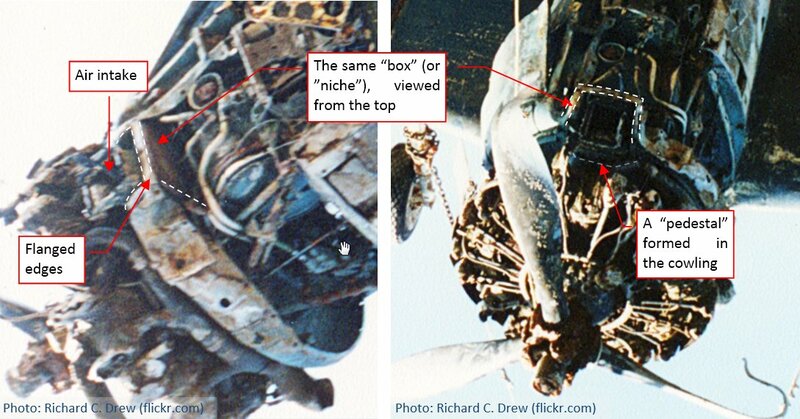 In the R-1820-32 from the SBD-1 I can see a kind of additional cut-out for the ignition cable, which is missing in this F3F-2. 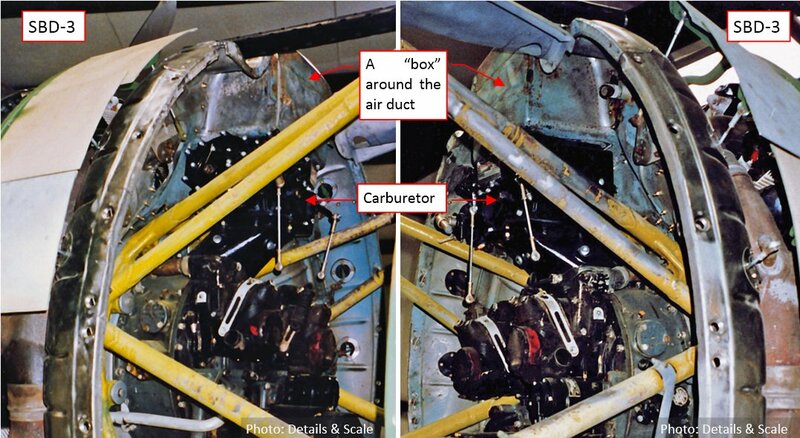 (F3F-2 had a different ignition harness – compare the deflectors in Figure “b” and “d”, above). This deflector also has a flexible tip. As you can see, I skipped here some details (Figure “a”, above) that do not appear on every object instance. Note the characteristic “bat-like” fitting in the front of this deflector (Figure “b”, above). (The R-1820-60 deflectors had different fittings). In the R-1820-52 (and -32 in the SBD-2) the deflector on the cylinder 1 top was mounted without the flexible tip, to fit below the air intake duct of the upper cowling (Figure “b”, above). Both of the cylinder 1 side deflectors also had their flexible tips removed, to fit below the gun troughs. In the R-1820-60 and -66 (used in the SBD-5 and 6) the cylinder 1 featured the full top deflector. (It was possible, because, as I explained in this post, SBD-5 and -6 had two filtered air intakes, used for takeoffs. For the higher airspeeds there was enough “fresh” air for the air intake hidden behind the cylinder row). The R-1820-60 had different fittings on the cylinder 1 side deflectors that fit the gun troughs (Figure “c”, above). 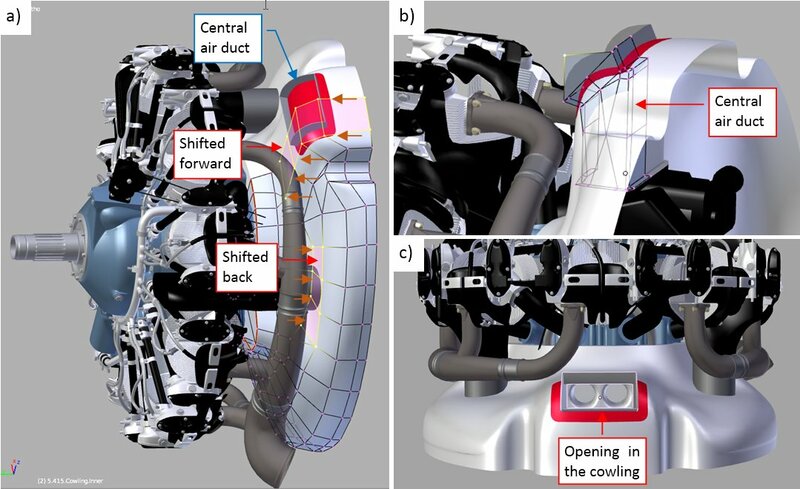 On the photos I noticed a kind of bulges, extruding from the both sides of the inner cowling (figure “b”, above). I assumed that they are shaped around small triangle plates welded on the sides of the mounting ring. (I have no photo to proof this assumption). Anyway, I modified the shape of the inner cowling in the SBD-5 to match this feature. 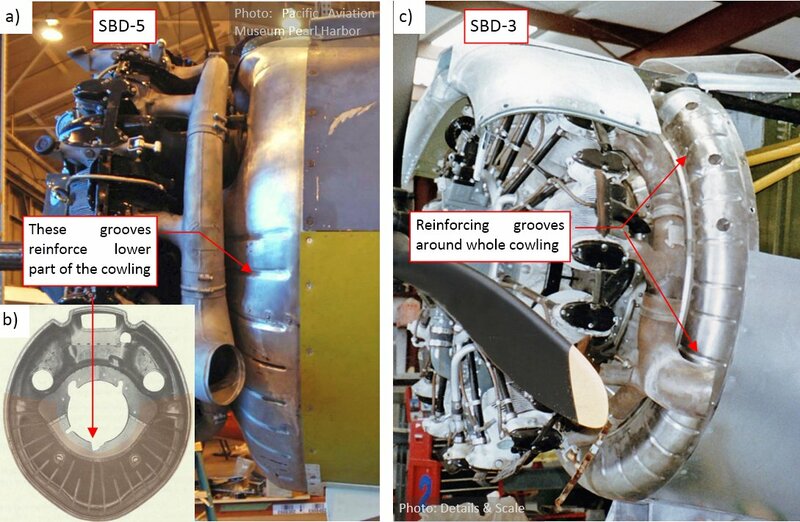 I assumed that the inner cowling in the earlier SBD versions (SBD-4, SBD-3,…) also had such “bulges”. 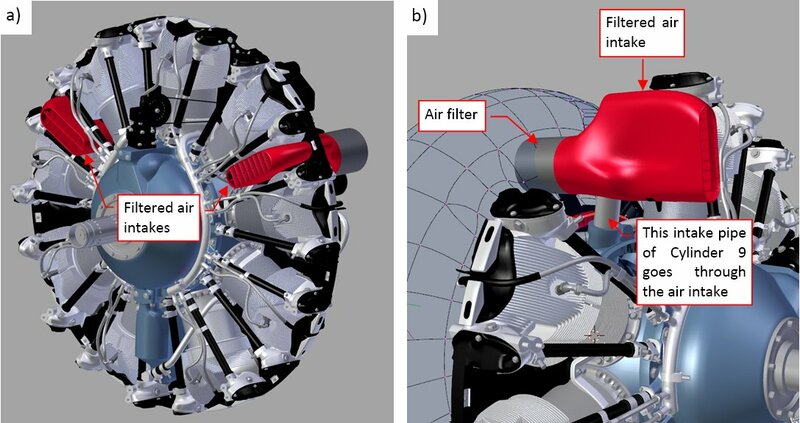 As you can see, these intakes are tightly fitted between cylinders 2-3 and 8-9 (Figure “a”, above), so they have a quite complex shape (Figure “b”, above). I do not have a photo for such an obscure detail, but the location of the filter determines, that the mixture intake pipes of Cylinder 3 and Cylinder 9 went through the corresponding intake body. (In principle, it is technically possible). I did not make holes in the deflectors between cylinders 2-3 and 8-9. (They would not be visible anyway, because both elements: the deflector and the intake are covered with black enamel). 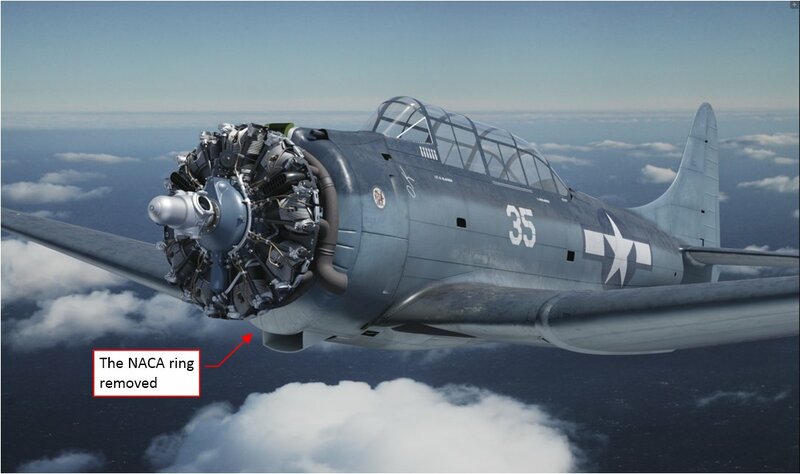 It seems now that Douglas designers modified a little the bottom part of the engine cowling in the SBD-5, shaping its circular “chin” (Figure “b”, above). 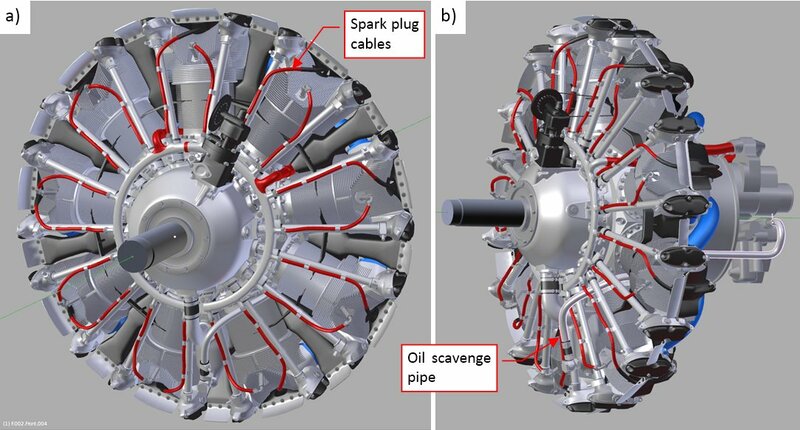 Maybe they did it because of the larger oil cooler used in this version? (It was required by the more powerful engine). If in the SBD-5 they shifted whole engine 3.5” forward, such an additional modification is also possible. (There was no any bulkhead at this station, and this cowling piece was already shaped anew). I shifted the engine along the fuselage centerline, until its crankcase matched the crankcase visible on the photo. Then I measured the f distance (Figure “a”, abve) and applied it to the SBD-3 and SBD-1 models. 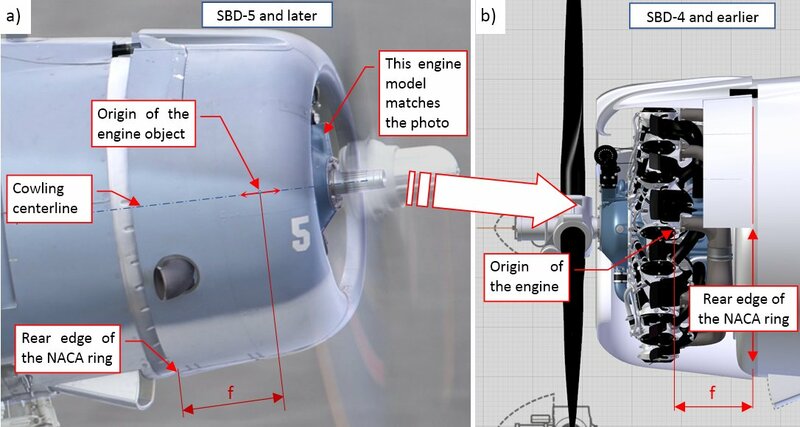 (In the SBD-5 the engine together with the NACA cowling was shifted forward, thus in the SBD-1 and SBD-3 I could not simply apply the absolute location of the engine origin). I am deeply in awe of your work. Thank you for the ongoing explanations. Amazing work. Keep it coming! thorst, Mark06GT - thank you for following! After “mounting” the R-1820 engines into my SBD models, I decided to recreate some details of the inner cowling (the cowling panels placed behind the cylinder row). In this post I will form the missing parts of the carburetor air ducts, hidden under the NACA ring. There are significant differences in this area between various SBD versions, which never appeared in any scale plans, or in any popular monograph of this aircraft. I think that the pictures presented below highlight these differences. They can be useful for all those scale modelers who are going to build the SBD “Dauntless” models with the engine cowlings opened. 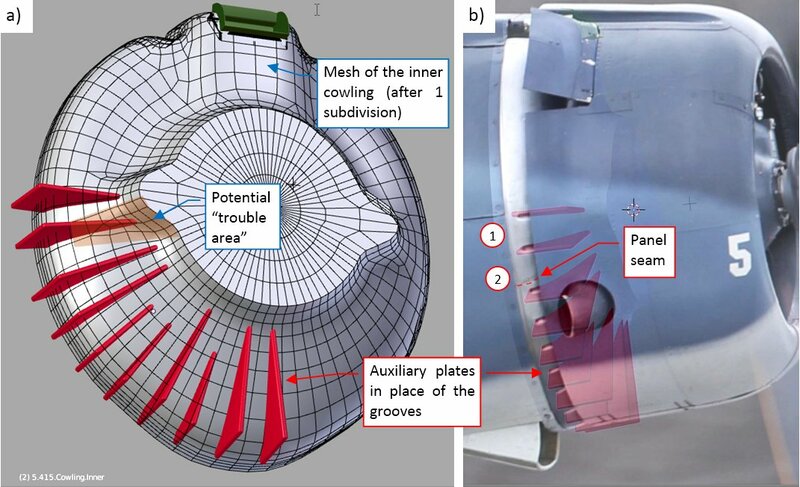 In Figure “c” above you can see the side contour of the inner cowling. 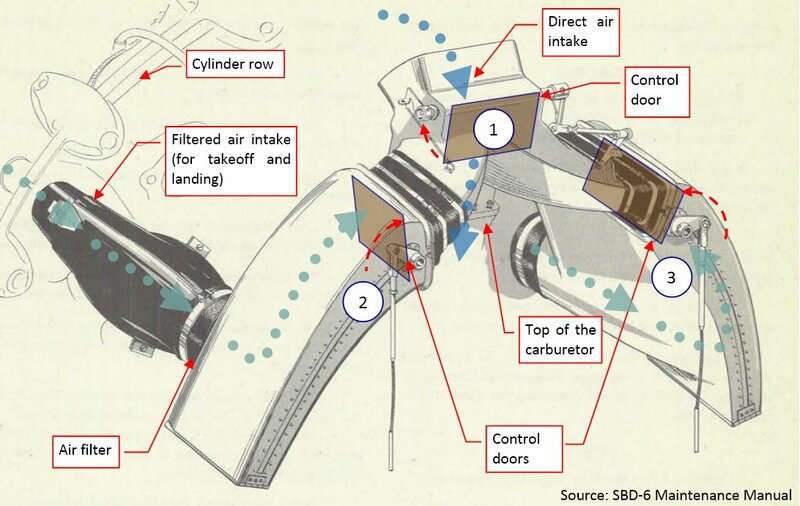 I can see that the central area is shifted forward (marked in blue in Figure “b”, above), and side segments around air filters are shifted back (marked in brown in Figure “b”, above). You can also see there the top of the air duct (this is a separate object). Figure “b”, above, shows its simple, “box-like” mesh. When both elements were in place, I used a Boolean modifier to cut out the central opening in the cowling (Figure “c”, above). I had some doubts about the forward edge of the upper cowling that overlaps the flange behind the air intake. Finally, I wrapped it around the topmost edge of the “niche” (see Figure “b”, above). 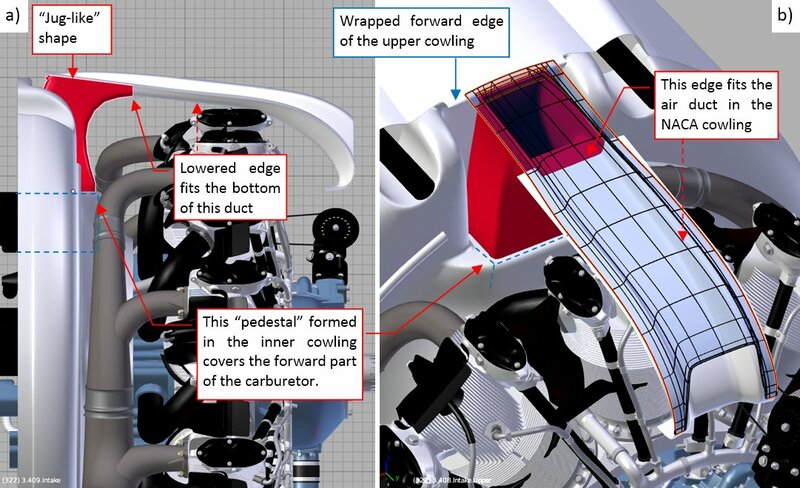 I also improved the shape of the “pedestal” in the inner cowling. (It covers the front section of the carburetor – see Figure “a”, above). I assumed that the air intake looked like that in the SBD-2, -3 and -4, because they share the same air duct design. 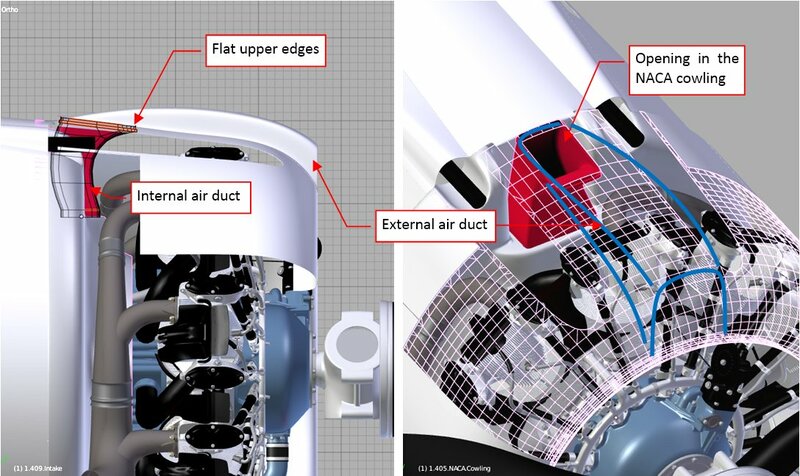 I assumed that the general shape of the internal, vertical air duct segment was as in the later versions. The only difference are the simpler upper edges, fitting the opening in the NACA cowling. (There was no “lower” part of the external air duct under the NACA cowling, which you can see in the SBD-2, -3 and -4). and here I thought I was nuts for modeling treenails on my boat… hats off, mate! this is insane modeling!! are you going to make a high res model for the carburator ? 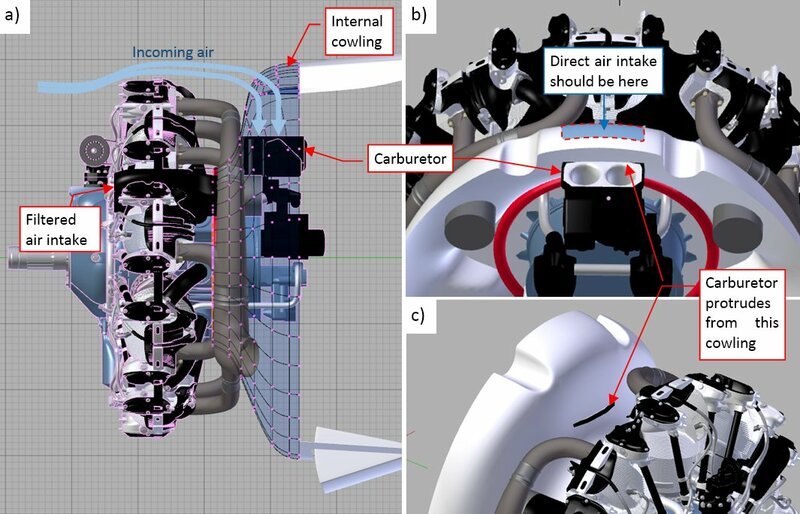 They are 0.7-1.0” wide (Figure “a”, above) and span over the inner cowling along its radial directions (Figure “b”, “c”, above). 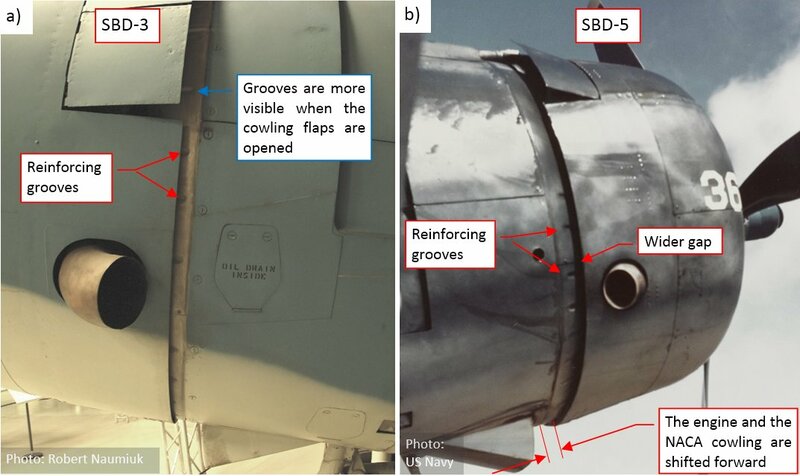 In the SBD-5 and -6 these reinforcing grooves occur only on the lower part of the cowling (Figure “b”, above), while in the earlier versions (SBD-1, -2, -3, and -4) they are also present on the upper part (Figure “c”, above). 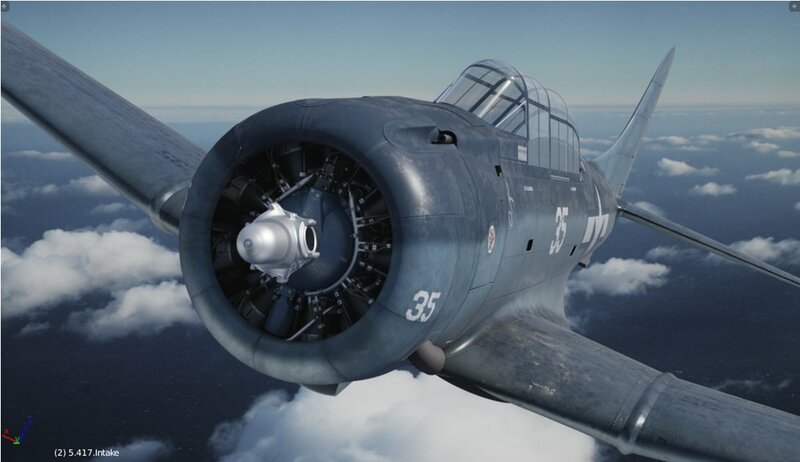 In the earlier versions (SBD-1…SBD-4) they appear on the narrow strip behind the NACA cowling (Figure “a”, above). You can see more of the upper grooves when the NACA cowling flaps are set wide open. In the SBD-5 and -6 the engine and the NACA cowling were shifted forward by 3.5”, and the gap between the NACA ring and the inner cowling is wider. 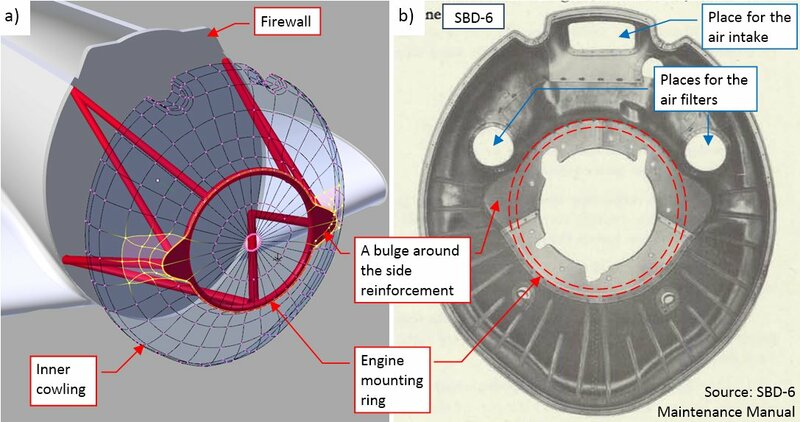 Thus, in these versions you can see even longer fragments of the grooves behind the NACA cowling (Figure “b”, above). Each of these plates is a simple, four-vertex plane. Its thickness is created by the Solidify modifier, and the rounded edges – by a multi-segment Bevel modifier. 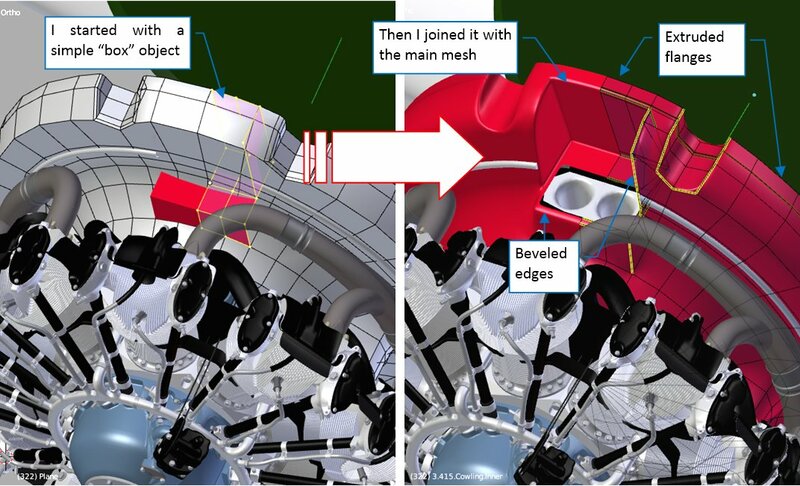 As you can see in Figure “b”, above, I set their locations and rotations, so each of their cross-sections with the cowling fits the edge of a groove visible on the reference photo. It occurs that the distances between the grooves are not uniform – as you can see, comparing the distances (1) and (2) in Figure “b”, above. (Note that there is a panel seam within range (2) – I think that this is the reason of this additional “spacing”). To fulfill requirement 2, I had to make the initial mesh of the cowling panel denser (subdividing each face once, by applying the Subdivision Surface modifier). You can see the resulting mesh in Figure “a”, above. 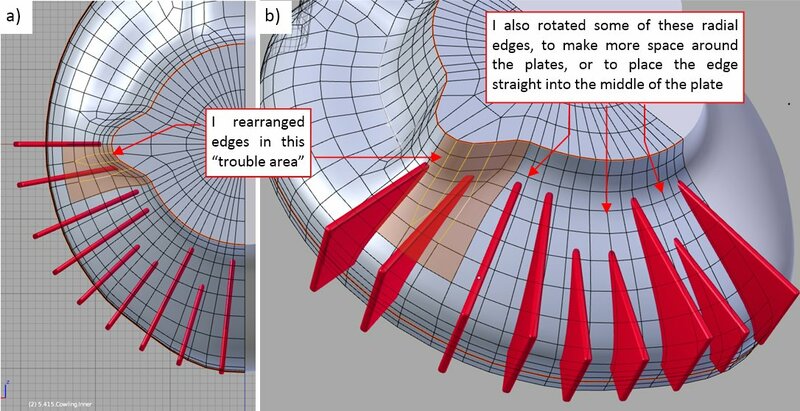 I also marked there the potential “trouble area”, where the plate is crossed by the skew edges. It is always better to know such a thing in advance. 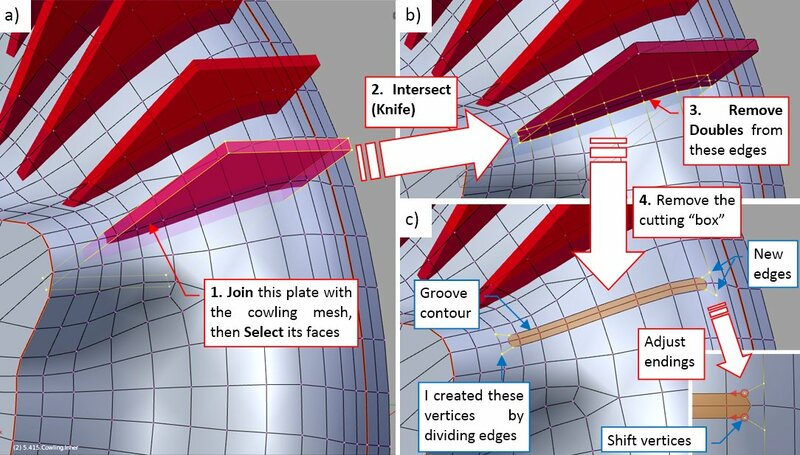 Then I invoked the Mesh:Faces:Intersect (Knife) command, obtaining the initial edges of the groove (Figure “b”, above). The Intersect (Knife) command produces some overlapping vertices, which I quickly fixed, selecting all of them and invoking the Mesh:Vertices:Remove Doubles command. I also removed the “cutting box” (I do not need it anymore). In the last step I adjusted the ends of this “strip”. I created four additional vertices (two of them at each end), to add four additional edges (Figure “c”, above). (I created these new vertices by selecting the corresponding edges and invoking the Mesh:Edge:Subdivide command). Finally I shifted the corner vertices of this strip inside, using Mesh:Vertices:Slide command ([Shift]-[V]). Figure “b”, above, shows the resulting surface. Conclusion: as long as you can, use bump maps to recreate such grooves. 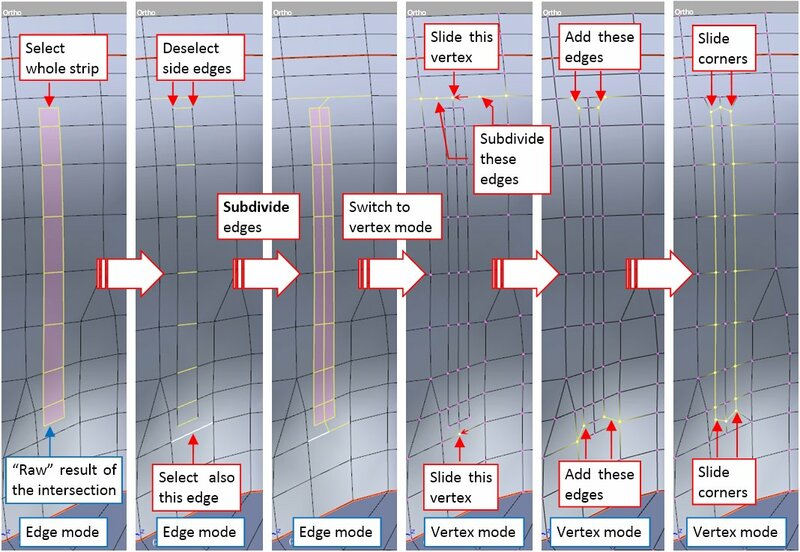 Recreating this feature by pure modeling requires much more work (by an order of magnitude). sorry for not replying sooner. yeah, I did use group instances on several occasions, like cannons and deadeyes, but unfortunately there aren’t many repeatable objects on the ship. pretty much everything is unique due to curved shape of the ship. mirror modifier is my main poison here. You could by now write a couple of master-class books on CG modeling at this point. It’s no wonder why people asked you early on about copyright licensing.